Where shall I take refuge? Where shall I scream? And tell me, what crime have I committed that I should take so much pain and suffering? You tell me, what is my crime? You human beings, you of awakened conscience, you who have founded organizations and say you defend the rights of children, you who claim that you support children who are struck by cancer, you who defend human rights and humanitarianism, you who are a worker like my father: I need you today, tomorrow may be too late. I have come to you in these difficult days, not wanting anything from you but a demand for the freedom of my father. 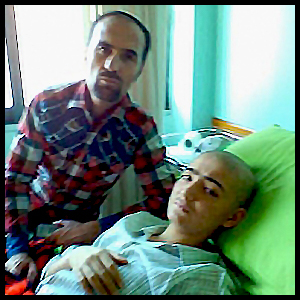 In these days of [my] chemotherapy, I want to have my father beside me. While fighting with cancer, I want to have my father beside me too. Is this a big demand? You tell me!